This is just a quick review of one of my favorite sushi restaurants ever. Whenever I visit the island of Honolulu, there are a few spots I frequent often. Chiba-ken Sushi Restaurant is my go-to sushi known for its happy hour pricing that fall under $10 on their most popular dishes. I discovered this place one evening while walking back to my home. My trusty Yelp app keeps me in the know and this place has some great reviews. So as any self-respecting Yelper would do, I walked in and pulled up at the sushi bar. Let me tell you this place did not disappoint. Chiba-ken Sushi Restaurant has standard sushi-esque décor with wood tables, black frames with Japanese writing, and room dividers. The fish served is very fresh as anyone would expect on the island. The patrons consisted of both locals and tourist. Although most tourist don’t know about the happy hour so the crowed transitioned as 9:30pm hit. The Happy Hour menu varies from night to night but below is example of their nightly pricing. My favorite items on the menu to order are the California Rolls that are made with REAL CRAB! That is very important to me as I hate imitation crab. I also like the braised pork belly. It has this sweet soy sauce marinade that really sets it off. 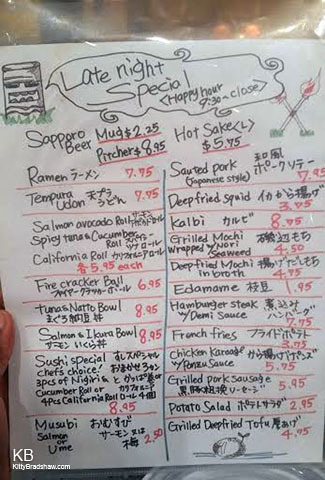 One of the most popular items on the menu and Yelp is the Firecracker Balls (shown at the top). I can’t really tell you whats in them, but it is amazing loll. My now ex-boyfriend had the short ribs which I was able to taste a piece from his plate. They were extremely flavorful. 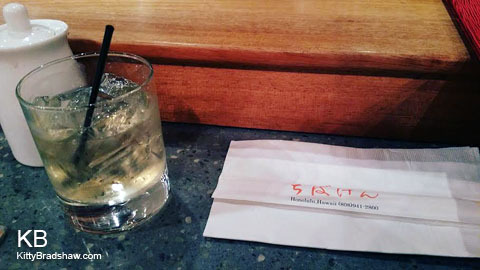 Lastly, I enjoy their house plum wine ordered neat or on the rocks (shown below). Again, I am a regular and find myself visiting several times during my extended stays. I would lie and say I want you to visit, but what I most enjoy about this restaurant is that it’s off in a quiet corner on a side street. It’s not too crowded and doesn’t feel as if you’re sitting in the middle of Times Square if you know what I mean. However in order for them to stay in business I will go ahead and plug them on the site, loll. 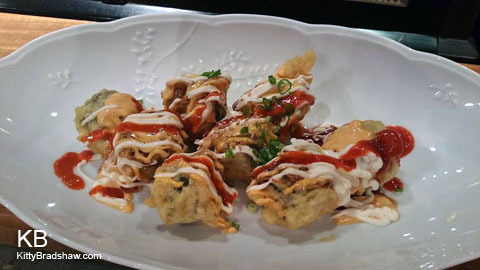 Enjoy your entrée at Chiba-ken Sushi Restaurant !! !